If you’re new to website development, the standard instructions for installing Drupal are likely to be a bit daunting. Even if you’re a seasoned pro, setting up a well-designed development environment — then tweaking it for optimal Drupal hosting — takes time and effort that you might prefer to spend on building sites. Luckily, there’s a growing set of online platforms that take the muss and fuss out of Drupal site building. As well as easing development, online Drupal platforms offer a range of server-side optimizations for fast and secure site hosting. Here’s a quick rundown of some of the options, with both features and limitations of each. Want to spin up a quick Drupal 7 site? 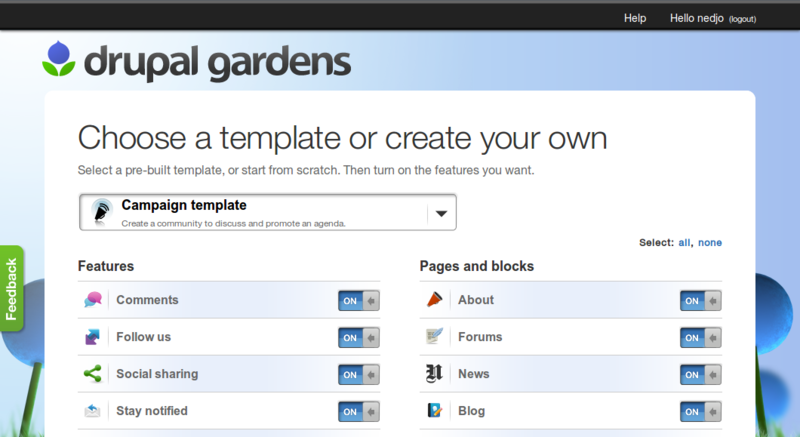 Drupal Gardens is your easiest option. Think of it as the Drupal equivalent of wordpress.com. At install time, you can choose from various site templates — campaign, product, blog — or customize your own. Several different theme options offer a distinct look for different focuses. As well, a richly-tooled theme editor enables finely tuned control over everything from color schemes and site layout to fonts, spacing, and backgrounds of individual elements like the site name or slogan. At any time you can download the files and database that make up your site and move it to a different host. Relax — when new versions of Drupal or contributed modules are available, the code updates are handled for you. You have no file-level access to your site: you cannot install modules or themes that aren’t already available on the platform. While you can customize sites post-install, Drupal Gardens does not offer Drupal distributions beyond the site templates offered at install time. You have only a single instance of your site, so changes must be made directly to the live site. There is no fee for a Drupal Gardens branded, subdomain-hosted site with low limits on bandwidth, storage, number of users, and other quotas. Paid plans range from $12 to $80 monthly per site (as of February, 2013), with discounts available for 12-month prepayment. Want to host multiple sites? Omega8.cc offers a hosting platform optimized for multiple Drupal sites based on distributions, or a custom site profile that you can create yourself. An admin UI allows you to manage multiple Drupal sites. Omega8.cc includes one-click installation of a large set of Drupal distributions that provide sites preconfigured for specific use cases, plus you can create your own “platform” — a specialized version of Drupal that you can install as often as needed. Distribution-based sites or a custom platform could be a great option for a network or company with various locations that wants to run multiple sites off of a common platform. Omega8.cc supports Drush, the powerful command-line Drupal utility, via limited SSH access. It offers Apache Solr search as an optional add-on for faster search and faceted search support. The UI is more complex than Drupal Gardens. While you can clone an existing site, like Drupal Gardens, Omega8.cc has only a single instance of each site by default. As of February, 2013, plans start at $56/month ($34/month if paid a year in advance) per “core,” with each core estimated to support up to five sites depending on site complexity and usage. The Apache Solr add-on comes with higher priced packages. Looking for a great development environment? Compared to Drupal Gardens and Omega8.cc, Pantheon is a big step up in both developer tools and complexity. More than a website, Pantheon offers highly optimized developer tools, complete with an advanced administrative UI to control backups, staging, and more. Besides Drupal core, Pantheon offers one-click deployment of an expanding number of Drupal distributions for uses including team collaboration (Open Atrium), publishing (Open Publish), nonprofits (Open Outreach), and more. A code repository is automatically created for your site using the Git software, allowing you to have fine-tuned control over your site code, and also to automatically apply Drupal updates when they’re available. Each site is given three different environments — development, testing, and live — with tools for synchronizing both code and the site database between environments. Pantheon includes built-in Apache Solr search support. It supports Drush, and automatically creates site aliases so that you can manage your site through running Drush commands locally. With a click you can fully back up your site or (with a paid plan) configure scheduled backups. As with Drupal Gardens, at any time you can download the files and database that make up your site and move it to a different host. Pricing is per site and is more costly than typical shared hosting. If you have simple needs or require multiple sites, this might not be your best option. There’s a learning curve to mastering the tools — including Git and Drush — and the workflow for moving code and content between development environments. It is best suited to more techie users. Pantheon offers up to two free developer sites, with the option to request additional free sites. Paid plans (as of February, 2013) are $25 per month for a basic site and $100 for a more scalable site, with additional enterprise-level options. Acquia Dev Cloud — an optimized developer environment. With plenty of great options to choose from, online Drupal platforms can help you get up and running quickly no matter what your knowledge level or site requirements. Downloading Drupal is easy; but then what? Tom explores the Drupal knowledge gap and tells you where to get the answers you need. Nedjo Rogers has been an active Drupal contributor since posting his first module, in 2003. 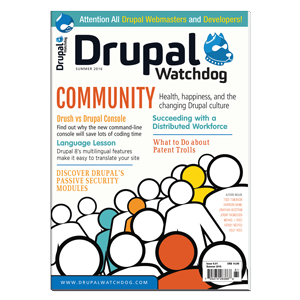 A lead contributor to the Open Outreach Drupal distribution for nonprofits, he divides his Drupal work time between Chocolate Lily Web Projects and Tag1 Consulting. He’s currently working up a solo show for this year’s Fringe Festival in his hometown of Victoria, Canada.